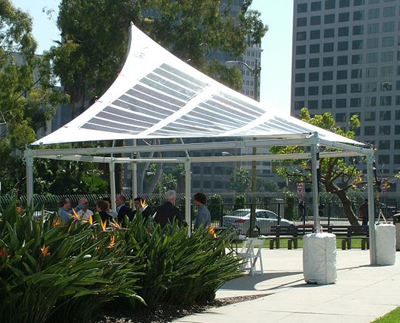 FTL Solar Power Fold unique patent-pending products are the first and only pre-fabricated, mass produced photovoltaic (PV) tensile structures in the world. FTL Solar structures are innovative and in this new green age, are an expression of practical function and form. I think it’s clear that applications of this product are almost endless; it’s open to humanitarian efforts to consumer energy shelters. It seems to me it’s begging for further development & to find a shelf at your closest mega store. + FTL Solar’s PowerFold click here.